The University of North Texas was founded in 1890 as the Texas Normal College and Teacher Training Institute. Since its founding, the university has been renamed several times, officially becoming the University of North Texas in 1988. The college of business was founded in 1946 as the School of Business Administration. The name was changed to College of Business in 1971. The undergraduate business program received AACSB accreditation in 1961 and the Master of Business program received AACSB accreditation in 1964. The College of Business is located on the University of North Texas campus located in Denton, Texas- about one hour from Dallas. It is located within the Dallas-Fort Worth metropolitan area. UNT also holds classes at The Universities Center at Dallas (UCD). UCD is a multi-institution teaching center located in downtown Dallas. The Federation of North Texas Area Universities, an educational consortium comprised of Texas A&M University at Commerce, University of North Texas at Denton and University of Texas at Arlington, provides operation of the UCD. The College of Business at UNT is organized into five academic departments: Accounting; Finance, Insurance, Real Estate & Law (FIREL); Information Technology & Decision Sciences (ITDS); Management and Marketing & Logistics. 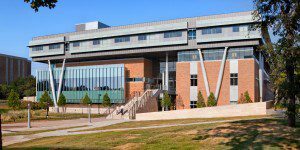 The College also has four interdisciplinary centers: the Institute of Petroleum Accounting, the Center for Logistics Education and Research, the Business Information and Technology Services center and the Faculty Support Center. The UNT Libraries have a nationally recognized digital library program that offers students access to collections of more than six million cataloged items. Library contents on the UNT campus range from government documents, law, business, economics, geography, political science and public administration to documents relating to research and collections of music. UNT also has more computers per student than any other public university in the Dallas-Fort Worth region. The College of Business recently moved to its own building. The Business Leadership Building occupies 180,000 square feet and contains 24 Apple TV-enabled classrooms and more than 222 offices for faculty, staff and doctoral students. In the new building, College of Business students have access to study areas, dining areas, group meeting rooms and a computer lab. There are 106 faculty members at the College of Business at UNT. Out of the 106, 73 are tenured faculty and 10 are tenure-track faculty. UNT faculty consistently works with students and other staff on various research projects. Eighty-two percent of College of Business faculty have a doctoral degree. Visiting faculty and scholars from over 50 countries have been guests at UNT. The most recent full-time MBA class entering the University of North Texas College of Business had 311 students, which was 10 percent of UNT’s graduate student population. MBA students have an average of five years of work experience. Forty-two percent of students in the College of Business are female. The average student age is 29. The College of Business at the University of North Texas offers an Accelerated Online MBA in Strategic Management or Organizational Behavior and Human Resource Management and 16 different flexible MBA program tracks, including multiple online MBA programs.